My post has just gone up over at the Sew Weekly--check it out! I'll also post some extra pictures and more detailed information here this week as well! But that's not all I am working on this week. 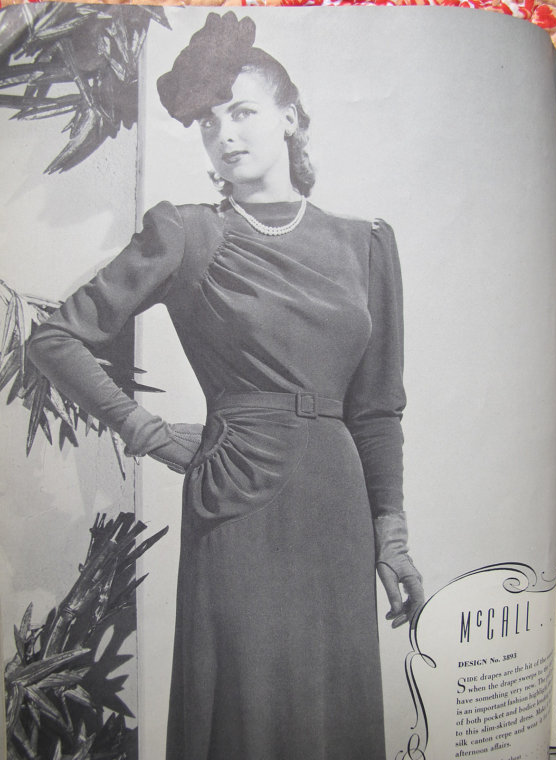 I am also starting a super fabulous dress for my sister from a 1940 McCall pattern (how very unlike me...giggle). And this pattern is also this week's giveaway (and you are going to LOVE it!!). I'm making my sister the short-sleeve version from an amazing teal cotton/wool blend. This will definitely not be a one-week turnaround as you'll see the pattern size is quite small (B30) and I need to do quite a bit of regrading. But I've made a copy for myself and have made one for my sister with all the new regrading. I hope to post a bit on how I regraded this pattern in case the winner wants to do some regrading as well! I'll announce the winner on Sunday evening and I'll ship anywhere in the world. Just note that it sometimes takes awhile for packages to arrive for those outside the EU but I'll aim to mail out the patterns by the following Friday. If you win a pattern, you can't win again for another six months. And again, the only caveat is that you don't sell the pattern. Keep the pattern for yourself as long as you want and when you are done, pass it on to someone else! YAY! Love this one and can't wait to see it made up in various ways!! Wow, what a stunning dress. A beautiful, long sleeve dress would be perfect for the cold winter we're having in Australia right now. I love this pattern. I bet this would look great as a short sleeve dress. I love the gathering on the top and pockets, super cute! This is seriously one of the most pretty patterns I have ever seen. Lovely! What a cool unusual pattern! Love the purple dress - it looks amazing, and the accessories are perfect. Oh my! This is just lovely! I would just have to go out and get a fabulous hat to go with it though if I won!! Beautiful pattern! I love the gathers and the size-closer to my own, though I'll still have some grading to do for my rectagular shape. ;P A pretty pattern that would be great fun to try! That is a gorgeous pattern and I think it's my size! Yay! Fabulous pattern!! and just my size. Ummm.... LOVE!!!!!!!!!!!!!!!!!!!! And I'd love to see how you grade! Love the pattern! I'd have to grade up; not been a size 12 since before children. You always have beautiful patterns where do you find them? Wow, as always, you have the most amazing patterns! The pocket on that 1940's dress is awesome - never seen anything like that before. This. is. stunning! Love the pattern, dearest, and I hope you'll post pictures of your sister's version soon! Gorgeous pattern that is! I love that pocket detail. It is a shame that most vintage patterns are tiny, but thankfully I'm able to enlarge them to my own size (which isn't tiny ;). 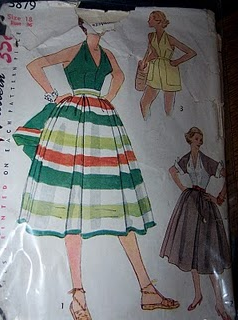 Yes I would love to try this pattern.I've enjoyed your posts at the sew weekly.I'd love to try making that halter too but then I'd have to make a halter bra...the forties pattern reminds me a little of a Vogue reissue. 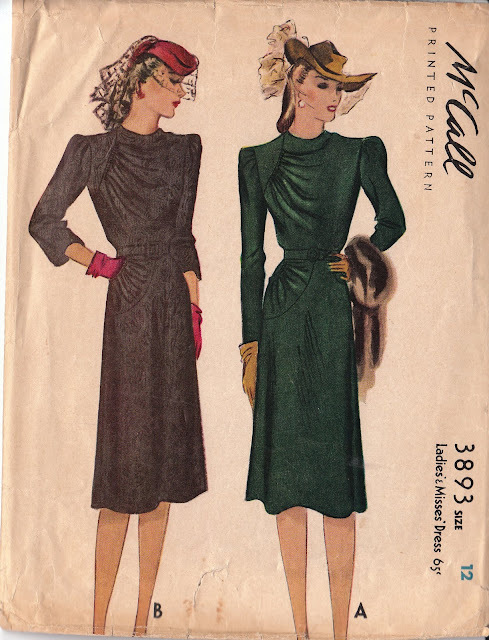 It's so elegant for winter.I'm doing a vintage fashion show this would be perfect for! I just posted about this giveaway in my own blog. So here's my second entry. Thank you! That rouching detail is so gorgeous. Your sister is a lucky lady! How lucky is your sister, Do you will pictures here when she wear the dress?? Of course, I will be happy to enter the draw, if I'm still on time. You are doing a beautiful job sharing all these patterns.